We don’t have any breeding stock available now, but I’d be happy to put you on a waiting list or help you locate another breeder. Click here to add you name to our email list. You will be the first to know when we have Hifalutin Dexters available for sale! Hifalutin Myrtle Bell (ADCA 41877) is for sale. Out of Hifalutin Ila (38407) by Brightlea Calum (31957), she is black, and carries both wild RED and DUN. In other words, if you like color in your herd, this is your girl. 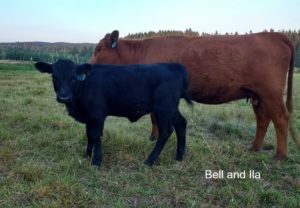 Born 5/1/2017, “Bell” is homozygous polled and A2/A2. Her parentage is verified (G5) and she does not carry Chondrodysplasia or PHA. Her sire descends from some of the best dual-purpose Dexters ever bred (Hiyu, Bedford, RDoubleD). Her dam is also a product of excellent breeding from Cascade’s, Spruce Grove, and Belle Fourche. Bell will be available at weaning at the end of October. She will be trained to lead and her price includes transfer of registration. Transport and certificate of veterinary inspection (for out of state buyers) at buyers expense. Her price is $1,600 and she will be held upon receipt of a 25% deposit. Anna Victoria (ADCA 41876) is out of Hifalutin Adagio (35640) by Brightlea Calum (31957). Anna is red (e/E+) and carries dun (B/b). Born 5/15/2017, she is heterozygous polled and A2/A2. Anna does not carry Chondrodysplasia or PHA. Anna’s dam has a lovely udder in her second lactation and her sire comes from lines known for their dairy traits (productivity and conformation). We expect Anna will be a fine example of a dual purpose Dexter and all signs point to that even at this young age. Anna will be available at weaning at the end of October. She will be trained to lead and her price includes transfer of registration. Transport and certificate of veterinary inspection (for out of state buyers) at buyers expense. Cascade’s Sweet Pepper (ADCA 30014) is everything you want in a Dexter cow. She is five years old and has had four calves. She has ample milk and weans big, strong healthy calves.We are only selling her because we have decided to keep her heifer calf this year and we need to reduce our herd. Pepper is 41-1/2 inches at the hip. 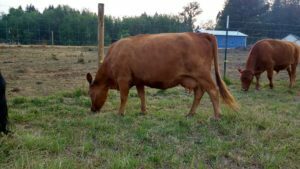 She is heterozygous polled, red (e/e) and does not carry dun. As are all of our Dexters, she is a non-carrier of Chondrodysplasia and PHA. She is also the friendliest cow in our herd and has passed that trait to all four calves. Although we have not regularly milked her, I have occasionally stripped milk to relieve pressure when her calf can’t keep up for a couple of days. She lets me milk her out while standing in the field, so I have no doubt she would be easy to train to once a day milking. 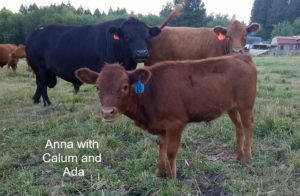 She is bred to Brightlea Calum for an April 2018 calf. Pepper’s price is $1900 and she will be held upon receipt of a 25% deposit.